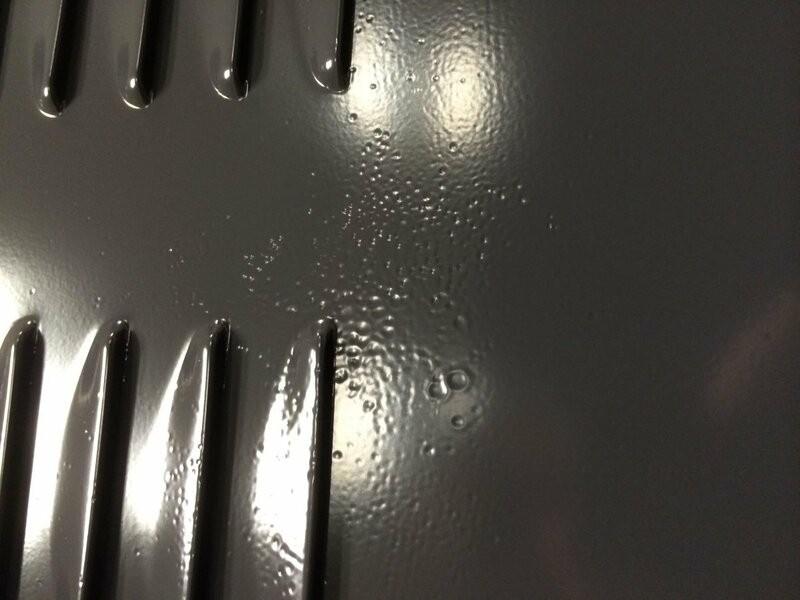 If your powder coating has chips, bubbles or has contamination (shown above) your customers won’t be pleased. As a job shop owner, powder coating specialist or coating line manager, you’ve probably dealt with unhappy powder coating customers. Dissatisfied clients can have a number of complaints: some customers are sensitive to price, others may be sensitive to turn-around times or coating mil thicknesses, others may be unhappy with overall finish quality or other issues. Unfortunately, you may not know why a customer is unhappy until the very end of the project or after the order has shipped. Whether they complain face-to-face, you hear about their remarks from someone else, or you see a negative review online, a dissatisfied customer can be frustrating to you and disruptive for your business. What’s worse, if you ignore them, it’s likely that a problem customer will only get worse. Business experts agree that when it comes to dealing with mad customers, there’s only one “right” way to react: Contact them, take some kind of action to address their grievance, and most importantly, act quickly. What angers already-irritated customers most? Being ignored or left waiting too long for a resolution to their problems. By responding to a customer’s complaints, you validate their need to be heard. Let them know your business is willing to listen. Approach your customers with genuine concern. View customer complaints as opportunities to demonstrate your shop’s commitment to customer service. A positive, friendly outlook will likely win over frustrated customers – as long as they have realistic expectations. Reliant Finishing Systems builds and sells powder coating appliances. They deal with customers from around the world through various websites and conventional resellers. Their staff monitors digital media constantly to provide quick responses to customers who publicly voice their dissatisfaction. They also actively contact buyers within days of providing equipment so they can learn about potential problems before they get out of hand. When dealing with their customers, powder coating shops can assure customer satisfaction by using a similar approach. Don’t use the “No News Is Good News” approach. Have an employee or third-party company proactively reach out to all of your customers to find out what they really think about their experience with your company. By documenting all of the comments–not just the good ones–you can get a better picture of what you’re doing right and where you need to improve. Some problems are truly isolated cases of miscommunication or poor performance, while others may be part of a larger issue. Reliant recently had a frustrated customer post something negative about the company on Facebook. Within a few hours of his post, the company called to resolve the issue. That level of awareness and responsiveness can help you grow your reputation, but it takes consistent effort. It also takes patience to remember that you’re dealing with real people who can be very emotional once they’re unhappy. It may be difficult to address a customer’s complaints, but it’s worth it in the long run. BE AWARE. Go to business expos and civic meetings that your customers attend. Listen to what’s being said. Try to interact with customers in a way that makes it easy for you to learn just how happy or unhappy they are. Set up notifications on your Facebook page and any other online outlets you use to interact with customers or sell online. Check your pages and your customers’ blogs or forum comments routinely to make sure they are happy with your company. BE ACTIVE. Reach out to frustrated customers immediately. If nothing else, let them know you’ve received their complaint and you’re company is working to resolve it. Problems are usually much easier to work out if the customer gets a personal touch. A face-to-face meeting is better than a phone call, and a phone call is better than an email or private message. REMAIN ENGAGED. Keep in touch with unhappy customers to resolve their issues and, when appropriate, offer compensation for their time and trouble. Sometimes a simple apology is all that is needed. At other times you may need to consider reworking bad parts or offering a discount on future orders. By staying involved with your customers, you help assure that their complaints are resolved—and that you have the opportunity to do work for them in the future. By staying engaged with problem customers and proactively reaching out to your existing clients, you can not only help solve their issues – you can help identify areas where your company does need to get better. A company that is known for helping to solve problems, reacts positively to critique and works to actively improve their relationships is a company whose reputation will grow and whose business prospects will increase. This entry was posted in News on January 6, 2017 by Reliant News.